BACKGROUND: After the fall of Soeharto in May 1998, Indonesia has seen little improvement in its political and human rights situation. A large-scale student demonstration demanding total governmental reform and better handling of the country’s financial crisis on 12 May 1998 resulted in four students being shot dead by the military. The demonstration continued on 8-14 November 1998, when the students rejected the Special Session of People’s Consultative Assembly (Sidang Istimewa Majelis Permusyawaratan Rakyat/MPR) for its unconstitutional nature, and demanded the president address the financial crisis. This saw the death of 18 students, with hundreds more injured. 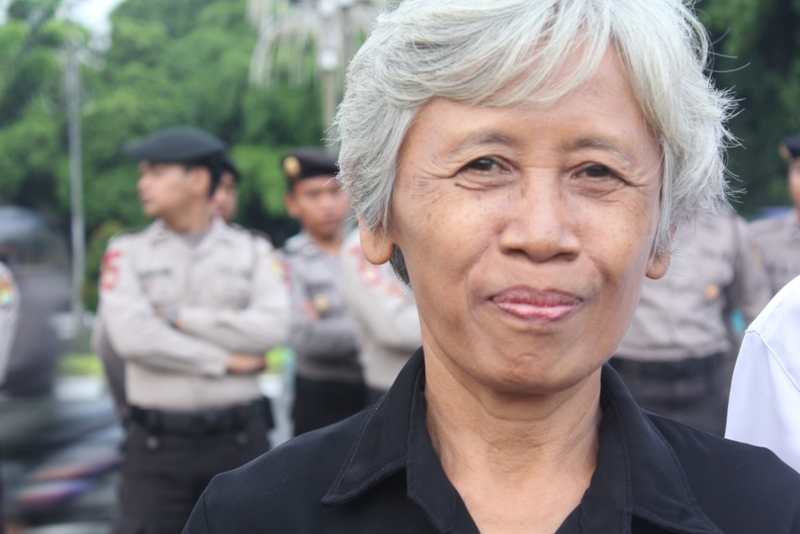 Maria Katarina Sumarsih is the mother of BR. Norma Irmawan (also known as Wawan), a student of Atmajaya Catholic University, Jakarta, who was one of the students shot dead by the military on 13 November 1998. The House of Representative (DPR RI) rejected this case to be taken up by the ad hoc human rights court since Semanggi I is not categorized as a gross human rights violation. This interview was conducted to commemorate 13 years since the tragedy. 1. Could you tell us about the incident that happened to you? On 13 November 1998, my child Wawan, a student of Atmajaya Catholic University, active in campus and society, took part in a peaceful protest demanding the rejection of the special assembly of the People’s Consultative Assembly (MPR), since the MPR needed to be reformed first. Before the protest, the students had held public discussions and other activities in order to open space for dialogue and prevent a recurrence of the Trisakti tragedy. According to the Human Rights Violations Investigation Commission (KPP HAM) Report by the National Commission on Human Rights (Komnas HAM), at 10am local time, in front of Atmajaya Catholic University, Wawan and his six friends were trying to neutralize the air from tear gas by spraying water hydrant. When one of his friends was shot, Wawan asked permission from one military officer to help his friend. After permission was given, Wawan raised a white flag as a sign to help his friend. However, when Wawan went to lift his friend, he was shot. According to the autopsy result, Wawan was shot with a standard military bullet. 2. How did this incident impact you? At that time, I cried and prayed. The atmosphere at the house was quiet. I just cried and prayed. My husband read and wrote. My other child, Irma, studied. Everybody just did their own business. Housework was not done by me, but my husband. Every time I smiled, there was a sense of sadness. However, after a long process and many people’s support, I can live as usual; I can even speak out regarding human rights violations now. 3. Could you tell us what you have done to fight for this case? For the first three months, I just sat in silence and read the newspaper at Wawan’s grave. Then, I wished to get a copy of Wawan’s autopsy result and met the military police. The chief of the investigation section (Kasidik) stated that the political pressure was very strong. Even though Wawan and I were right, we would be considered as wrong. He also asked me to bring witnesses regarding this case. I had proposed five witnesses, but the military police never called them. I also met KontraS, Tim Relawan Kemanusiaan (TRK), students and others. After I heard a sermon at church about Wawan, I decided to fight. When I heard there was to be a peaceful protest at Hotel Indonesia traffic circle (Bundaran HI) held by women activists, I joined it, and met many activists. I also then became active in many human rights activities, such as dialogues, seminars, gatherings and others. Together with NGO’s and other victims, I also did lobbying and took part in hearings with relevant institutions. The House of Representative then established a special committee (Pansus) to investigate this case. The result was that three factions agreed that Semanggi I was a gross human rights violation, while seven disagreed. After Law No. 26/2000 concerning the Human Rights court was enacted, the Supreme Court asked us to urge Komnas HAM to investigate this case. Two years later, Komnas HAM conducted an investigation into the tragedies of Trisakti and Semanggi I & II. Komnas HAM declared the tragedies to be gross human rights violations. However, the result of the report went back and forth from the attorney general. Once, the attorney general even stated that the result was lost. As of now, the report is still with the attorney general, and he still rejects to investigate and submit the case to the ad hoc human rights court for baseless reasons, such as nebis in idem (the principle that no legal action can be constituted twice for the same cause), when in fact there has been no previous trial for Semanggi I. In 2008, we met Indonesian President Susilo Bambang Yudhoyono. He promised that he would establish the ad hoc human rights court and punished all perpetrators. In 2011, we also met the Coordinating Minister for Political, Legal and Security Affairs, Djoko Suyanto. He made the same promises as the president. Until now however, there is no action at all from the government. The case still has to wait for action from the attorney general. 4. In your opinion, what are the current possibilities for you to get justice? What obstacles do you face? While I am waiting for the settlement of the case at the attorney general’s side, I always participate in the silent protest every Thursday in front of the Presidential Palace. I also cooperate with the Indonesian History Teacher Association (Asosiasi Guru Sejarah Indonesia/AGSI) to tell the truth about the Semanggi tragedy to students. I also made a book based on victim testimonies. I want to say that we cannot be silent even though the government neglects our case for years. I always participate in the silent protest, yet I will never be silenced. I and other victims even sent a letter to the president, without caring whether our letter will be read or not. We will do everything that we can. Regarding our letter, some of our letters were replied, yet the answer is normative; just stating that our case should be settled in accordance with the law. The obstacle I face is impunity–the law enforcement not performing their function, and political obstacles. While the House of Representative passed a law regarding the human rights court, some articles did not give justice to the victims, such as provisions regarding amnesty for the perpetrators and so on. The government also did not implement the law; for instance it did not establish the ad hoc human rights court. Moreover, while the president promised us to prevent the recurrence of such tragedies, he appointed people allegedly responsible for human rights violations as state officials. 5. The Semanggi I case has been going on for 13 years. In your opinion, how is the condition of the other victims? Are they still fighting? Some of them are in despair, such as Yap Yun Hap’s mother. She stated that she felt like screaming in her room, “The one and only person to hear me is myself. The government is not listening.” The other victims have died or are sick, so they cannot participate in the fight. I think that must be understood, since every person has their own limits. Fortunately, I have to thank God because until this day, God has given me good health. 6. Have you ever felt tired and thought about quitting? I feel tired actually. However, like a candle which is never suppressed and a narrow alley which has no dead-end, my spirit won’t go in difficult times. I will not stop fighting. As long as Wawan is in my soul, I won’t stop. 7. What is your motivation to keep fighting? My motivation is my love for Wawan. He always supports me. My sorrow has been transformed into love for humans, whether they are victims or not. 8. In your opinion, who is the most responsible in your case? The president at that time, B.J. Habibie and the top person of the army, Wiranto, are the most responsible persons in my son’s case because the command system in the military is very disciplined. Nothing is done without orders from superiors. 9. What is your hope and demand? I hope the government urges the attorney general to investigate all human rights violations, such as the tragedies of Semanggi I and II and other cases. The right or wrong must be declared in court. The House of Representative must make the recommendation to the President to establish the ad hoc human rights court. If there is an argument that this case cannot be brought to the court because there is no proof, that is absolutely a mistake. 10. What is your message to the international community? I hope that the international community urges the Indonesian government to solve the human rights violations in the country. I am aware that without any support from the international community, our case will never be heard by the government, like the Munir case. Even though the main perpetrator was not found, Munir’s case would never have been submitted to the court without international support. 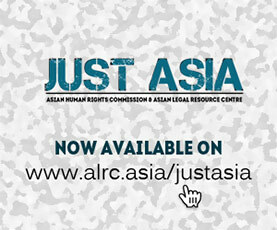 I also hope that the international community voices its concern for all cases of human rights violations in Indonesia.